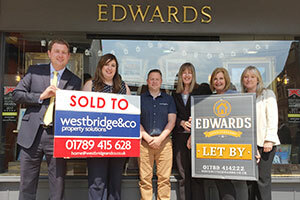 Westbridge & Co Limited (Residential Lettings) has been sold in May 2018 to Edwards Estate Agents Limited. Richard Johnson founded Westbridge & Co Limited in 2008 in the middle of the largest property recession since the 1930’s. Having started the business from the back of his garage the business soon grew and occupied a prominent shop front premises at 20 Rother St in the heard of Stratford upon Avon. Richard’s passion over the years become focused on Commercial Property Agency so in May 2018 Edwards Estate Agents Limited made the considerable acquisition of the residential business which has meant Richard can now focus solely on Westbridge Commercial Limited. Richard Johnson said “I am very pleased with the sale of the residential business to Edwards which will give them a considerable market share in Stratford allowing them to bolt in our sizable residential management portfolio and client base. There is no time for me to take up golf, as some clients have joke about, I am more focused than ever on growing our already successful commercial agency Westbridge Commercial Ltd and have many exciting developments coming forward in the next few months”.